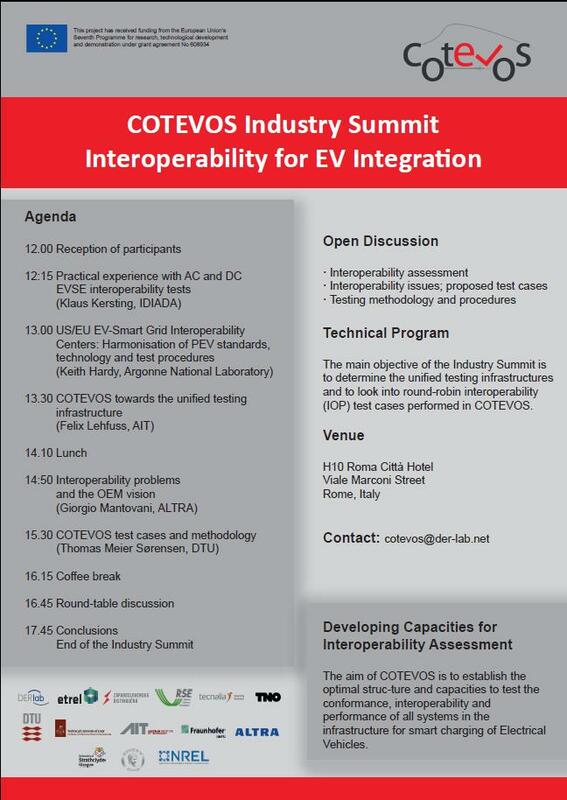 COTEVOS is pleased to invite you to the COTEVOS Industry Summit, to be held in Rome, on 25 May, 2015. The main objective of the Summit is to exchange visions about the test cases, methodologies and procedures for EV interoperability assessment. The COTEVOS Consortium will present the knowledge and progress achieved by this advanced stage of the project. The event participation is free of charge, we are looking forward to your registration (limited number of participants). You can find the agenda of the COTEVOS Industry Summit here. You can register for the COTEVOS Industry Summit here. The Industry Summit is held in parallel with the 5th International Conference on Smart Grids, Green Communications and IT Energy-aware Technologies.